The Bell Boeing V-22 Osprey team is meeting a major challenge-aircraft affordability-head on. The team's goal is to reduce unit flyaway cost by 22.5 percent to reach a target of $58 million per aircraft by fiscal year 2010. "We must bring the cost down to a point where our customers [the U.S. Marine Corps, the U.S. Navy and U.S. Special Operations Forces] can buy the V-22 in the quantities they need to support their missions," said Dan Korte, Boeing Integrated Defense Systems V-22 program manager. "The main thrust of the affordability effort is to reduce the cost to $58 million by fiscal year 2010 through various affordability initiatives and a unified approach from the V-22 Joint Program Office [made up of Bell, Boeing and the customer]." The V-22 is a multi-mission, multi-service tiltrotor developed and produced by Boeing Integrated Defense Systems in Philadelphia and Bell Helicopter Textron in Fort Worth, Texas. The Osprey can take off and land like a helicopter and, once airborne, rotate its engine nacelles forward to convert to aircraft mode. 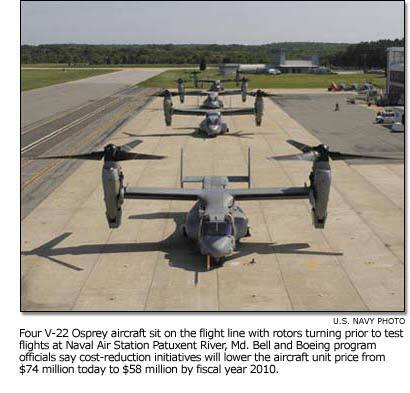 The V-22 Osprey program has invested about the same amount as its unit-cost target -more than $58 million in fiscal year 2003-to implement 28 cost-reduction initiatives, and is reviewing numerous new ideas that follow strict implementation guidelines. Affordability teams at Boeing and Bell Helicopter Textron are focused on generating, submitting and implementing ongoing cost-reduction ideas. The plan calls for an investment of more than $150 million over the next three years, a multi-year procurement in fiscal year 2007 and an increased production rate. The plan is based on a formula that an investment is returned within 50 aircraft after implementation of a cost-reduction idea, said Art Lallo, Boeing IDS V-22 affordability manager. "We try and meet the 50-aircraft average-break-even requirement, but we accept a higher break-even if substantial weight or sustainment [support] savings can be achieved," Lallo said. "Obsolescence and cost avoidance are other factors that govern whether or not an idea warrants further investigation." The current Boeing and Bell affordability teams are building on the work of previous affordability teams the two companies formed in 2002 in response to a renewed emphasis on cost reduction by the U.S. Naval Air Systems Command and company management. The teams aim to develop and implement cost-reduction initiatives to meet the V-22 unit-cost target. The cost-reduction plan focuses on design changes, suppliers and process improvements. The affordability teams work closely with all of the V-22 integrated product teams to ensure they have the support needed to implement their ideas. Also, the affordability teams support production focal points and Employee Involvement teams to ensure the maximum number of cost-saving ideas are being generated. "However, it's not the quantity of ideas that's most important. It's that we find the best ideas with the highest payback," said Korte. "That's why we need the entire V-22 team to continue to come up with new suggestions. This allows us to continually reprioritize and always implement the highest value-at-stake suggestions." The Boeing affordability team ensures that all integrated product teams have the necessary tools and processes to help them with their ideas. The team must coordinate with contracts, proposals, configuration management, production and engineering to submit the most credible ideas to cut cost. Each cost-reduction initiative is thoroughly researched and goes through several gate reviews that include the customer. A very extensive business case model is developed to substantiate return on investment, net present value and the point when the initiative can be incorporated into the aircraft. "We welcome all feedback from the team as we stay focused on our objective: getting the aircraft cost down," said Lallo. Supplier participation is another critical part of the equation. According to Lallo, approximately 50 percent of the V-22 cost is associated with supplier content. In addition to the current focus on affordability, efforts are under way to focus on total life cycle cost. Future initiatives include developing a database for the V-22 to ensure costs to repair, maintain and support the V-22 are completely understood at the time the aircraft is fielded. "The Bell Boeing team continues to focus on affordability in balance with all aspects of the program to ensure the V-22 remains the preferred solution for the customer," said Korte. "This will enable the program to provide an effective, suitable and affordable product of the highest quality, reliability and maintainability for our warfighters."